You could start next year, or the year after that or in ten years. Or, you could decide that the right time is right now. Here is a little advice and encouragement from people who’ve done it themselves if you decide to jump in. What is your best tip for someone just getting started with Project 333? It helps to put stuff in storage and not feel like you need to part with all of it for good. If you put almost everything you take out of your closet away in storage for 3 months there is a good chance you will be willing to part with some of it after that. Have no fear. You won’t mess up! Start by getting rid of clothes you actually dislike. Once something goes into the discard pile, it CANNOT be retrieved. I did this last year. Made piles. 1) keep 2) think about 3) donate 4) trash. I put all the think about in a drawer and the hanging items on different color hangers that I turned backwards in the closet. Set a date and I had not even worn one item. All went to Goodwill. My closet looks so awesome and I feel great! 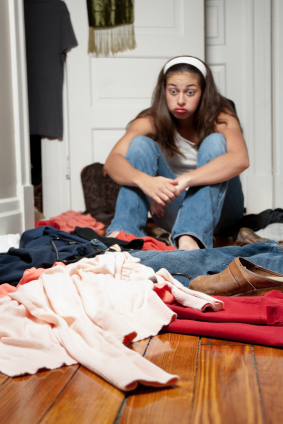 Don’t choose things to take OUT of your wardrobe…take it all out and choose your favorite things to wear, put the rest in a bag/s or storage boxes (or at least hang in a different wardrobe) and then when the season changes get the stored clothing out and start again! Take it all out… Put more in storage than you want to… You’ll be amazed at how you don’t even want it. Go on a long trip and only take one suitcase of things you really need. All things at home if not needed in three months will not be missed. Connect with other people doing Project 333 for the first time or recruit a friend. Do not go shopping. Do not watch shopping channels. Do not surf online shopping sites. For every new item, sort an old one out! If it feels really hard to part with an item, remember that you can wear it in the next phase! Pick a color palet and stick to it. If you try to do everything at once, it’s overwhelming. Do it step by step and you will see success! Fear not! it will be okay; in fact it will be great! I haven’t done Project 333 officially, but I did my own version of it when I downsized my wardrobe down to 50 items when I started living as a minimalist. That didn’t include shoes, accessories, underthings, or workout clothes. I’ll be doing another downsizing soon — I used the hanger trick! In December (6 months after I started), anything still on a backwards hanger will be purged. Some people think I’m nuts, but I don’t care, because I feel so much better knowing that whatever I pick from my closet will look good and feel good on me. To echo the advice of others, it is easier to take it ALL out and then decide what deserves to go back in, rather than going through everything in its “natural habitat” and deciding what to remove. And you don’t have to get rid of it all, just store it for the duration of the project and revisit the idea of discarding it later when you have detached from it. You cannot fail at this. It’s just three months of your life. If you decide that you love your clothes, or your shoes, or your accessories so much that you can’t part with them, that’s fine — after the three months. Challenge yourself. There is nothing wrong with loving shoes, but keep in mind that anything taking up space in your closet should have to earn its place. It’s no use having a closet full of clothes or shoes that are impractical or that you never wear. Be honest with yourself about your attachment, and you might be surprised how good it feels to self-examine and let go of things. Keep me posted and let me know if I can help! A trick that worked for me: In the first go around, I made accessories all freebies outside of the 33. Next time around, I’ll count those too. BTW: avoiding shopping channels & websites was a critical component for me! Great advice. I love that you made the project your own. Courtney, thank you for the project! I started Project 333 without including jewelry, but after one month I noticed that -amazingly- there were 6 items i had not worn at all. So I replaced them with 6 pieces of jewelry and packed the rest away. It’s just crazily unbelievably how stylish, neat and presentable it’s possible to be with just 33 items, and so easily compared to … maybe 333 items. To think I used to have 33 scarves! I absolutely love this project! I love looking in my closet and drawers and seeing only what I like to wear! The tip that worked wonders for me was to limit my color pallette. My challenges were that I didn’t want to use the black/white/gray pallette which is so easy, because my coloring suits brown. So brown it is. No more 2 sets of accessories to match black or brown. I kept the makings of a few favorite black/gray based outfits and got rid of the rest. The other challenge is that I have been given a lot of jewelry over the years. I’ve decided to not cull any of it, and use it to add spice and variety to my outfits. I find myself dressing to suit the jewelry now which is fun. I don’t wear a lot at once, just one key piece. This project meshes nicely with my earlier resolve to buy no clothes this year with the exception of a pair of yoga pants recently and underwear that I will need in January. My motto this year is ‘wear it out’. I want this to work for me so badly, and I hope that since it’s fall, I’ll have better luck. I tried in the spring, but summer came early and I had to break into my stored wardrobe for summer clothes. Then it didn’t seem worth it to start over in July. But sweater weather has arrived, so it’s time to start loving my wardrobe again! I started project 333 a little over a year ago and went from two huge (and full) closets to one small (and half empty). If I had to give one advice it would be: “Stay the f*** away from the mall !”. And not only the physical mall but online shopping as well. My suggestion: Install LeechBlock on your computer (a nice firefox add-on that blocks you from choosen websites), make a list with all shopping sites that come to your mind and set the list to “block all day”. You’ll be surprised how fast you forget about them. About 15 years ago, I dared myself to travel with one carry-on to Europe for 2 weeks. I did bring a tote in the event I bought some things that would not fit in the carry on. Fixed that by considering having things shipped, stopped buying large books if I could find them here in US in fact only got two small ones. Look for large ones in library and decide to keep purchases small or edible – like picnics. I love fun but not precious jewelry and socks so that is where I focus my purchases. Mostly jewelry – and it works great. But I did Develop MS and needs certain person items that do impact my packing. But it is kind of fun to go to a drugstore in a foreign country and look for what you need. I do the single bag thing all the time now, even in Winter. Cashmere sweaters can be layered or used as a scarf. Polypro or silk longies can make most outfits work in the city in cold weather. And I live in Seattle and have plenty of options for nice raincoats. Scarf or two is a must as well and can makes lots of things look fancy. I still have to work on this for everyday but I am working on it. thanks for the ideas and processes. After years of having clothes all over the place but never having anything the wear, I asked my husband for a new wardrobe system for my anniversary present instead of anything else. In the run up to this I didn’t buy any new items so that we could save up as much money as possible. I then had a cull of all clothes that were past their best or no longer fit. It was not as ruthless as this 333project but i have to say that it has been the best purchase ever! I now have the dream grown up bedroom with all my clothes in one place. This has made it so much easier dressing every day . As a treat for not buying anything for 8 months (apart from some replacement tights and knickers) and because I had some money left over I went a girls shopping trip and arrange for a personal shopper to help with the gaps in my wardrobe that where now obvious. It has been over a year now and even with all the jan sales on I have still not needed or been tempted to purchase any new items. Don’t get me wrong my wardrobe system takes up one whole wall of my bedroom so I had a lot of clothes to start with, but now I have a place for everything I am finding that things are lasting longer as they are not piled on top of each other and I can easily find items to make up outfits. I will continue to refine down my items from now on but wanted to share my thoughts with those of you that may have had the same problems getting dressed as I did. Sometimes spending the money on getting organised is more beneficial then buying that new fashion trend. I’m starting this tomorrow, and as I’m sorting my clothes, I wonder if my school uniform and work uniform are part of my 33? I started following the 333 project one of the first days of January, and I’m still amazed how different I can dress using the same 33 things. I didn’t count acessories, shoes/boots, outerwear in the 33 items. Might try that next time. I’ve alredy changed some of the 33 items for new ones, because they were quite old, and they have been donated. They were the right color for me, but didn’t fit in. I’ve got a question. I love the concept and am doing sort of this for years. But I run in to a practical thing I can’t find an answer on here. The laundry. We are with only 2 persons, and I constantly run out of clothes because it is all in the laundry. I wash dark, colour, white and undies, but want the machine to be full. How do you do this? My top tip is to group similar things. I recently sorted all my shoes by type – dress shoes, sandles, knee length boots etc – then only kept my favourites in each category. I donated several pairs which I liked, but rarely wore. I think that sticking to a color palette for a 3 month period was hanging me up when I first started trying to put my wardrobe together for January 1st. It took me a while to play around and get the hang of it and see how limiting my colors would be more conducive to mixing and matching more than unlimited colors would. I finally just picked a couple accent colors that were already in my wardrobe and put everything else in storage. So far, I haven’t had a single problem and I find that I am using my scarves and necklace more often to change things up a bit. My experience, albeit short so far, has been very positive! Every year in summer they either show a nautical pallet of red, white and blue or they show a beach pallet of corals, turquoises and sand colors. Every fall they show browns, oranges, or wood colors. In winter, they show true dark greens, dark blues, and reds. Also snowflake patterns or shiny silver or gold. Spring is always delicate colors or pastels. True pinks, light blues, peach if you can wear it. Classics like pearl necklaces never go out of style. Or a pair of gold or gold tone button earrings or silver tone if that’s what you prefer. Fads never last. Look at older books on style and see what the classics are.